Michael Coulter (No. 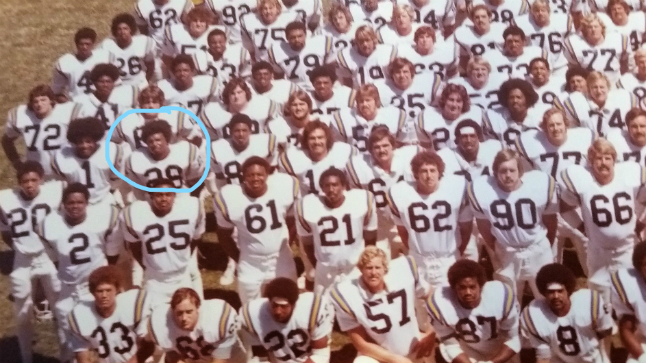 28) on the 1976 Rose Bowl championship Bruin football team. He maintained a high level of fitness for decades after his athletic career, but developed heart failure in 2014. He received a heart transplant in 2017. As a defensive back on UCLA’s 1976 Rose Bowl championship football team, Michael Coulter went on to play professionally with the Oakland Raiders. Later, after leaving football, he would rejoin his alma mater and begin a 20-year career with the UCLA admissions department, where he mentored African-American student athletes and advised inner-city youth. Even after his years as a professional athlete, Coulter maintained a high level of fitness with regular workouts. Then, one day in 2014 when he was 58-years-old, he noticed that he was losing his breath while jogging. He shrugged it off as probably being a result of a recent bout with the flu. When his breathing did not improve, he went to see a cardiologist, where he was shocked to learn that he had congestive heart failure, a chronic condition that occurs when the heart muscle doesn’t pump blood properly. Medications helped Coulter for a few years, but then his heart condition worsened and he was unable to sleep or breathe while laying down because his chest was filling with fluid. In addition, he had developed atrial fibrillation, which causes the heart to beat irregularly. In July 2017, his cardiologist, Dr. Eugene DePasquale, checked him into Ronald Reagan UCLA Medical Center for what he and his wife, Clovette, anticipated to be a short stay for treatment. Later that evening Dr. Mario Deng, a professor of medicine in the cardiology department, came into Coulter's hospital room to deliver troubling news that the couple had not expected to hear. After Deng introduced himself, he explained that the medications were no longer helping--and that Coulter needed a heart transplant. Deng asked Coulter if he wanted to get back to where he was before his health started to fail. “Absolutely," he replied. "Being an athlete I want to get back to my work out and doing what I do." Coulter remained in the hospital for two months before receiving a donor heart in August 2017. Now he uses his experience as an athlete and mentor to motivate others, whether he is visiting patients, speaking at educational seminars or participating in heart walks. 1. Find a doctor who will be your coach. As an athlete, I always had a coach who knew me and I trusted him to help me succeed. I thought of Dr. Deng as my coach and I put all my faith in him. 2. Partner with your care team. I was used to working out and wanted to push myself harder than my nurses and doctors were used to. I also did not want to take pain medications. Work with your medical team to come up with a plan that fits your personal needs. 3. Be active. While going through treatment, walk as much as you can and then walk some more. I wore out the nurses because I walked circles around the unit! The exercise also helped to spur my appetite and boost my mental state. 4. Stay positive. Look for the positive aspect in your situation. When I visit patients in the hospital who are waiting for a transplant, it can feel depressing. I talk with them about how lucky they are to be on the transplant list and reassure them there is hope. 5. Think about longevity. When Dr. Deng started talking with me about longevity, it opened my eyes that there is life after transplant. Now, my mission is to encourage student athletes, and people of all ages, to see a cardiologist as part of a wellness physical. Because you just never know if there’s a hidden problem.